What is the Middle Years Programme? The International Baccalaureate Middle Years Programme (MYP) is an interdisciplinary programme of international education. The Middle school follows an inquiry based methodology. 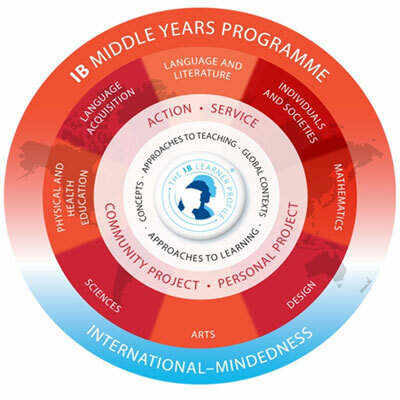 Middle Year Programme (MYP) provides a framework of academic challenge that encourages students to embrace and understand the connections between traditional subjects and the real world, and to become critical and reflective thinkers. The high school programme consists of eight subject groups integrated through five areas of interaction that provide a framework for learning within and across the subjects. In the final year of the programme, students also engage in a Personal Project, which allows them to demonstrate the understandings and skills they have developed throughout the high school programme. Community and service starts in the classroom and extends beyond it, requiring students to participate in the communities in which they live. The emphasis is on developing community awareness and concern, a sense of responsibility, and the skills and attitudes needed to make an effective contribution to society.Human ingenuity allows students to focus on the evolution, processes and products of human creativity. It considers their impact on society and on the mind. Students learn to appreciate the human capacity to influence, transform, enjoy and improve the quality of life. This area of interaction encourages students to explore the relationships between science, aesthetics, technology and ethics. Environments aims to make students aware of their interdependence with the environment so that they become aware of their responsibility, and may take positive, responsible action for maintaining an environment fit for the future. Health and social education prepares students for a physically and mentally healthy life, aware of potential hazards and able to make informed choices. It develops in students a sense of responsibility for their own well-being and for the physical and social environments. The personal project is of significance in the MYP as students work on this project for an extended period of time. The personal Project aims at demonstrating students’ personal abilities, developing their research skills and surfacing their understanding of the topic with relation to application of methods and techniques. The personal project is to be linked to global context. How does MYP benefit students? Emphasizes, through the learner profile, the development of the whole student-physically, intellectually, emotionally and ethically. Approaches to learning is concerned with developing the intellectual discipline, attitudes, strategies and skills that will result in critical, coherent and independent thought and the capacity for problem solving and decision-making. The aim is to support and encourage student learning. The assessments play an important role in the development of ATL skills, especially the ones related to subject-group objectives. Varied in approach- written, oral presentations, field work, practical work, role plays, debates, exhibitions, research papers, tests and examinations, peer and self-assessment. Criterion related- students assessed against learning objectives which are published for each subject and each grade level. The aim is to find out what skills the students have acquired and what level of understanding can they demonstrate. All MYP 5 students are externally moderated for their Personal Project, which is a consolidate demonstration of their learning. Moderation offers students an international recognition of their achievement in their personal project. Survey No. 53, 54 & 58, Hissa 2/1A, Fountain Road, Off Pune – Nagar Road, Kharadi, Pune – 411014, Maharashtra, India. © 2019 Best IB School In Pune.